Many in the Low County region of Beaufort treasure tradition and South Carolina history. We love the Beaufort SC area because this little community maintains a deep connection with the past. This has been a factor that helped some of the pre-Civil War buildings survive. Unfortunately most are privately owned and are now unavailable to the public. 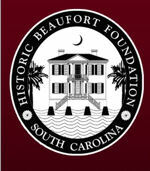 The Historic Foundation of Beaufort South Carolina welcomes the opportunity to share their citys heritage with visitors. The members of this group have helped preserve and renovate some wonderful places in the downtown area for all to enjoy and is a big part of South Carolina Tourism. Older homes and buildings can stir my heart and imagination, as they do for so many others. A recent walking tour of the Town of Beaufort introduced me to the John Mark Verdier House and Museum. The John Mark Verdier House Museum has become one of my favorite Beaufort landmarks and has a part in South Carolina history. This fine, older home is a testament to the beauty of Federal style architecture. 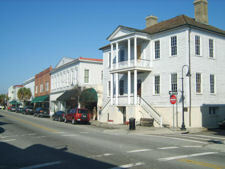 Its located in the downtown area of Beaufort South Carolina on Bay Street. John Mark inherited his fathers estate in the 1700s and became even wealthier by selling cotton in Europe. Verdier built a wharf and storage buildings for his ships and then spent much of his money constructing his new home on the opposite side of Bay Street. Admissions - $10; ages 6 & younger are free. This 3 storied structure has black shutters that frame the large windows which are part of the Federal style. The tall columns lining the porch are classic and add extra elegance. There is a double set of entrance stairs leading to the main porch. As with all homes in this area South Carolina history reveals that the ground level was used more as protection against the frequent flooding of the streets. On the second floor, or main level, I marveled at both the formal dining room and old fashioned drawing room. 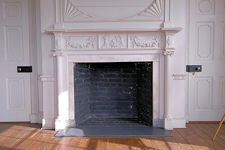 The furnishings and accessories are exquisite period pieces that add to the authenticity. In fact a number of items are original to the home. The private quarters for the family members have gleaming hardwood floors and antique furniture that made me appreciate the craftsmanship of the 18th and 19th centuries. At the top of the gracefully curved interior staircase is a large ballroom with a small adjoining area that ladies would use to refresh themselves during a party. The Marquis de Lafayette was a visitor in this home; and during the Civil War the Verdier property was used as a headquarters by the Union Army. By the time the war was over John Mark had lost much of his fortune. According to South Carolina history and the story I was told he had overextended his credit long before this time and he had been in danger of bankruptcy before the war began. The Beaufort Historical Society finally arranged to purchase the home from the Verdier family during the 1940s. In the 1960s active preservation and renovation activity began to restore Beaufort South Carolina history. Now this museum gives a real look at how some of the Beaufort residents lived more than 200 years ago. South Carolina Tourism is attracted to this area to visit such places.